Ever since I laid eyes on the magnificent space that is Cipriani’s 42nd Street,I’ve longed for a reason to attend an event there. Last Friday I got the chance. My friend Kevin Heald tipped me that Alta Cucina was giving away tickets to an Italian wine tasting there. SensofWine is presented by Italian wine expert, author, and creator of his own wine-tasting method, Luca Maroni. Maroni cut an elegant figure in his trim, dark suit, and his sharp features were lively as he addressed the crowd. I attended the portion of the day dedicated to the trade, and, as such, came home with his thick and informative book, Top Italian Wine Producers 2009, a terrific reference. Thirty-nine Italian wine producers representing 14 different regions were in attendance. The event was overwhelmingly grand, housed as it was in that cavernous space. Cipriani 42nd Street is a landmark building, previously the headquarters for the Bowery Savings Bank. 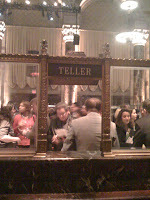 Walking the perimeter of the huge room, I could see wine being poured through the old teller windows. In such a large tasting, it’s tough to get to every table, so I zeroed in on the regions where I planned to travel later in the spring. In the Tuscany area, I liked Serraiolo’s 100% Sangiovese and their white made from Vermintino, which was bright, bursting with fruit, with a lovely finish. The Sada Carpoli 2005 Toscana was a big wine made in the Bordeaux style, combining Cabernet Sauvignon, Cabernet Franc, and Petit Verdot. It’s aged for 18 months in small oak barrels known as barriques. 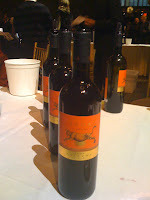 This wine was full and rich with layered flavors and a long finish. This was one that could age. One of the pleasures of the evening was discovering that Riondo now offers pink Prosecco, an Italian sparkling wine from the northeast. Cotton-candy colored, it was a beautiful, bubbly treat. I finished up tasting the extensive line of wines from Negretti, whose Bricco Ambrogio was the best wine I had tried at the tasting. All of this wonderful wine was complemented by the authentic Italian treats: freshly carved Prosciutto, tangy chunks of Parmesan, olives, and beautiful hors d’oeuvres such as tiny cones of fried calamari and grape tomatoes filled with Pesto. The wine was delicious, the food was great, but it was the Italian producers who stood out in my mind as most impressive. Their welcoming ways and warm smiles were the best PR for their products. When I told them I planned to travel to Italy later, many of the winery representatives—who varied from hired staff to the owners and winemakers themselves--insisted that I stop by to see them. “Come, visit, it’s beautiful, we’re right by the Mediterranean.” I can’t wait to take them up on their lovely invitations.